Poisonous and Deleterious Substances Control Act violations accounted for the vast majority of drug offenses committed by juveniles since the said Act was amended in 1972 to criminalize paint-thinner abuse, etc. The number of juveniles referred to public prosecutors for violations of the said Act decreased sharply around 1993, after having reached a peak in 1982 at 29,254, and has continued to decline (See Fig. 4-1-2-1). Fig. 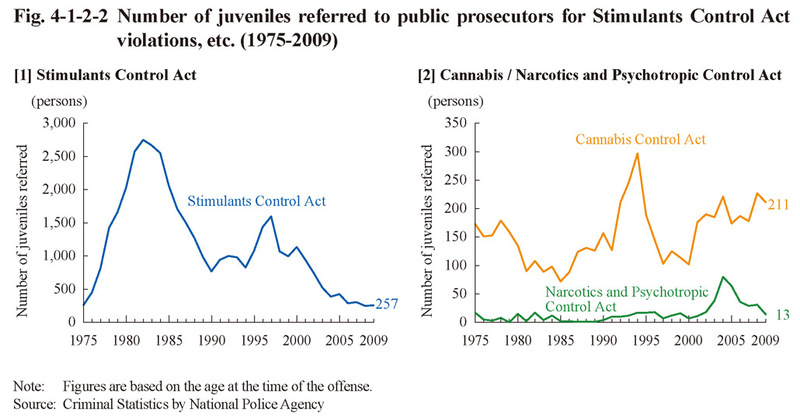 4-1-2-2 shows the number of juveniles referred to public prosecutors for violations of the Stimulants Control Act, the Cannabis Control Act, and the Narcotics and Psychotropic Control Act since 1975. The number of juveniles referred for Stimulants Control Act violations increased sharply between 1975 and 1982, reaching a record high in 1982 at 2,750, but has generally since been on a decreasing trend, being 257 (up 3.2% from the previous year) in 2009. The number of juveniles referred for Cannabis Control Act violations has remained around 200 in recent years, being 211 (down 7.0% (id.)) in 2009. The number of juveniles referred for Narcotics and Psychotropic Control Act violations has generally been on a decreasing trend since 2005, being 13 (down 58.1% (id.)) in 2009. Most of them were for synthetic narcotic drugs such as MDMA, etc. (Source: The Criminal Investigation Bureau, National Police Agency).